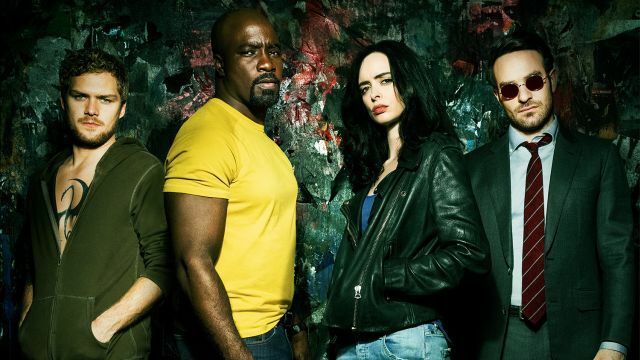 This past Friday, the Netflix equivalent of the superhero team of The Avengers dropped in the form of The Defenders with 8 episodes showcasing the combined strength of Daredevil, Jessica Jones, Luke Cage, and Iron Fist as they square off with one of the most powerful groups around, The Hand. All I can really say about this series is that it does a great job building one cohesive story all the way through and does not spend much time on side stories like their stand alone shows tend to do. We all know it's to help build a stable universe, but (and this especially targeted towards "Iron Fist") they tend stray away from why we really tune in. We want to see action and one main story being shown, and with the season of Defenders only being 8 episodes long, they get straight to the point. The Hand are hunting down Danny Rand because they need the Iron Fist to open a door that leads to a cave that houses a material that give The Hand their immortality. This door happens to be in New York City. Though nefarious means involving hiring the youth of Harlem as lackeys and an architect that goes missing, Luke Cage and Jessica Jones get involved, while Matt Murdock comes out of retirement to become Daredevil once again. Even though this is a group show, there really is one main character that becomes the center point of the whole thing, Iron Fist. He becomes the most important person in this show, and at first, I was worried because of how "Iron Fist" was considered to be the least exciting show to watch of the stand alone series. But as story kept going, they actually did some really good work on making Danny an interesting character, especially his interactions with Luke Cage. They have pretty good chemistry with each other and I would love to actually see a Heroes For Hire series down the road. The Hand is lead by the Five Fingers, which include Madame Gao (from "Daredevil" & "Iron Fist") and newly resurrected Bakuto (from "Iron Fist"). But the main leader is newcomer Alexandra Reid (played by Sigourney Weaver). She brings Elektra back to life using the Black Sky (that was mentioned in Daredevil) and used her to try and help bring her plans closer to completion. Overall, I like Sigourney in this, however, because she was billed as the big villain in this show, I wish she did more. She is mostly a schemer, and she did display a tiny amount of fighting skill, but her character felt very under utilized. As for Elektra, if any of you read my Daredevil season 2 review, you would know that I was not a fan of her. And I'm still not a fan of her in this. She plays the character slow flat and bland, it's almost impossible for me to show any interest in whatever she does. And the whole story arc revolving around her and Daredevil in this is still my least favorite thing. Any time she shows up to kill people, he has to try and save her, and every time, he leaves the other high and dry. Jessica Jones spends the whole time not actually wanting to be apart of the group. After the events with The Purple Man, she wasn't taking cases and wanted to be left alone for awhile, and the first case she takes leads her into the path of The Hand. I love her, I really do. She probably has the least amount of screen time, especially when it come to the fight scenes. But when she does, she steals it in my opinion. And I feel like that's how she should be in this. She's stuck with a guy who is bullet proof and two martial artists, all she has is super strength. She doesn't have any martial arts training of any kind, so her hanging back and making the saves when they really matter works in her favor. Overall, this show did what it needed to do. It was entertaining, straight to the point, and showed us some insight on what may happen in each series' next seasons. However, with that said, because of how straight forward it was, the plot and dialogue did lack a little. There was a lot of over explaining and repetitive nature and the fight scenes were O.K. at best. But I think if they re-work the 8 episode format for all the shows, they could really have some tights stories going in. I do recommend watching them if you can. The Hype For "Stranger Things 2" is Real!